Have charity viral campaigns had their day? A couple of weeks ago I was asked by Resource Alliance to participate in a live debate, chaired by Fundraising UK’s Howard Lake, on whether charity viral campaigns have had their day. The debate was to launch the opening of registrations for their free virtual fundraising conference – Fundraising Online – which will take place on May 13 to 14. Viral campaigns are like lottery tickets. Every so often someone hits the jackpot. But for every winner there are tonnes of losers. I argued against the motion, saying that it’s far too soon to say that these types of campaigns have had their day and that success means different things to different charities and the word ‘viral’ is actually damaging. I’d love to know if you agree with me that charity viral campaigns are only in their infancy, therefore they certainly have not had their day or whether you agree with Sean that they have already reached saturation. Please leave a comment below. I’m a Squared Online Graduate! I started my Squared Online – Google’s digital marketing course- journey in July 2014 and am very proud to say I graduated on Thursday! If you are interested in the course, I have blogged throughout. One of the highlights of the course has been the people I have got to meet in my two project groups – really talented, clever people who were a pleasure to work with. I have learnt a lot from the course but as it’s an online course, you do need to put in the time and effort. I’m particularly proud of my team’s Google Analytics report for the fourth project. Our group was cited as one of the best reports overall and my Conversion Report was chosen as ‘the best of’! For our last project we had to produce a Whitepaper and our group got the insurance sector. Once again ours was cited in the live graduation class as one of the best, so I’m immensely proud of my group and the hard work we put in. Congratulations to all my fellow July cohort Squares and all the best to those still on the journey or those starting out. Give it your all! I’ve been a supporter of Child’s i Foundation for years now (I’ve written about them loads of times on this blog). Today I received the loveliest ‘thank you’ video from them, which they have kindly allowed me to share. You see, the video is a private link on YouTube so only those with the link can see it, which means it’s just for me but because it is such a wonderful piece of charity content, I just had to share it with you. Child’s i is a small charity making a big impact. I hope this video inspires you when you next thank a supporter. Think about how you can make them feel special, like this video makes me feel. If I post a picture of a cat, will you read this? I read this article today by Hadley Freeman in The Guardian, Comment is free on how no one will notice when the world ends because we’re so distracted by pictures of cats on the internet (and other things like a dress that’s blue/black/white/gold/who actually cares). 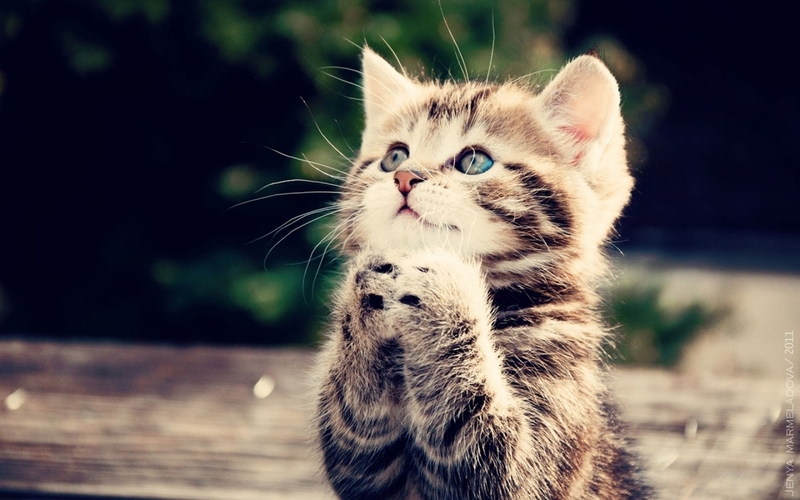 Speaking of cats… (well, I did promise you a picture if you read this – I think it’s praying for our souls). My first reaction was: She has a point. #TheDress trended on Twitter for two whole days. It’s had numerous articles written about it, including the BBC, The Independent etc, yet the atrocities of the world continued – Boko Haram posted a video of an execution, an opponent of Putin was murdered in front of the Kremlin not to mention ongoing conflict in Syria. But people weren’t really talking about that, were they? Are we so consumed by fluff on the internet that we’re forgetting to shout out about injustices or take action to stop atrocities? Personally, I don’t think so. Actually, I think the ‘fluff’ is sometimes just what’s needed to take our minds off these atrocities – just for a moment. Not to forget, not to pretend it’s not happening but to give ourselves a break from the awfulness of the world and have a laugh or a ‘ahhhh’ or a ‘I think it’s white and gold’ moment. And this made me think about charities. There are so many charities who deal with stories of child abuse, of addiction and what that does to a person/family/society, stories of people with incurable diseases, stories of bullying, self-harm, depression, suicide… imagine if that’s all these charities ever talked about? I can guarantee you wouldn’t. You’d unfollow them on Twitter, hide their posts on Facebook, unsubscribe from their enewsletters and worse – stop supporting them. And that’s why it’s so important to balance your communications. I know that sometimes charities find it difficult to have light-hearted posts (that aren’t about fundraising) because they think that it’s detracting from the seriousness of their work. Here are people/organisations to follow on Twitter who talk about charity, digital, comms, marketing and mobile. If you have any others to add, please mention them in the comments. I’d like to introduce you to the best group on Facebook for people who work in the charity sector in PR or Comms (although just ‘charity’ will do really as we talk about a whole host of topics). The Third Sector PR and Communications Network was set up by Rob Dyson of Whizz-Kidz and the group has grown to over 2,100 members. Members can post questions, ask for advice, share relevant content or even post jobs. Recently we had a great debate about Binky Felstead being paid by Barnardo’s to promote their retail shops. The best thing about the group is that you can post a question and get answers in minutes. It’s also a great way to network and get some peer to peer support. So if you’d like to join, send a request! Please take a look at the pinned post and send me a private message if it’s not clear from your Facebook profile that you work in the sector. This is to avoid spammers.